Let me be clear— I really like unusual and creative ideas. Especially in music. Some of these work. Others don’t. But they’re all fun and show how awesome collaborations can be. 1) “Over and Over”— Nelly ft. Tim McGraw: Probably the best known song on my list, this song was unquestionably the most successful. This song hit number 3 in 2005. 2) “Dirt Road Anthem (Remix)”— Jason Aldean ft. Ludacris: Reversing it up from the first song on this list, we look at a country song with a rap verse sprinkled in. 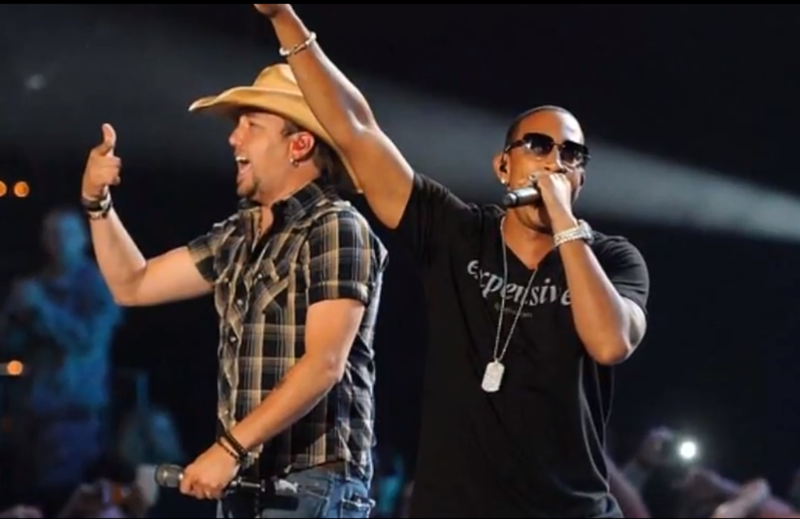 Atlanta rapper Ludacris made this remix of Jason Aldean’s number one country hit unforgettable. 3) “Jumpin’ Jack Flash”— Aretha Franklin ft. Keith Richards: Bet you didn’t know the Queen of Soul decided to take on one of the Rolling Stones’ classic tracks. She did, and Keith even helped her do it. 4) “Street Rock”— Kurtis Blow ft. Bob Dylan: Music legend Bob Dylan raps. Need I say more? 5) “The Gambler”— Kenny Rogers ft. Wyclef Jean: Take one of the classic songs of rock and roll, then add some Haitian hip-hop. Sounds pretty awesome, right? 6)”Gone Going”— Black Eyed Peas ft. Jack Johnson: Hip-hop’s bad boys (and Fergie) decide to lay down some beats with Hawaii’s soulful wonder boy. 7) “Party for Two” — Shania Twain ft. Mark McGrath: I don’t know, something about “Man! I Feel Like a Woman” singer Twain with the guy who sings “Every Morning” from Sugar Ray is weird. Am I crazy? 8) “California Gurls”— Katy Perry ft. Snoop Dogg: I’m sorry, I know this song was huge, but really Snoop? Can you say sellout? He might have actually traded in all of his street cred to make it. Then there’s the behind-the-scenes video, which is just awkward and weird. 9) “Can’t Stop Partying”— Weezer ft. Lil Wayne: Um, yeah, no words for this really. Except Wayne is sick on this verse. 10) “Revolver” — Madonna ft. Lil Wayne: Yeah, Lil Wayne on any pop song seems to make the potential for weird increase. Singing with the 1980s original pop princess is just weird (but again, I think it works). He also dropped some sick rhymes for JLo. If you know the name Sara Bareilles, it’s probably because of her two most famous songs— “Love Song” and “King of Anything.” Well, her latest is called “Uncharted” and it features an unusual cast of characters performing in it. Among the musicians who make appearances: Adam Levine and Jesse Carmichael of Maroon 5, Josh Groban,Pharrell Williams of N.E.R.D., Jennifer Nettles of Sugarland, Ben Folds, Ryan Tedder of OneRepublic, Laura Jansen, Ingrid Michaelson,Vanessa Carlton, Tegan and Sara, Cary Brothers, Greg Laswell, Adam Gardner and Ryan Miller from Guster, and Keenan Cahill. They all mouth the words to her song and happily bop about. And they all seem to do it in front of their computers, without any sort of professional camera equipment. Basically, this is an amazing idea. In human history. Ever made. Without a doubt. Take a listen if you don’t believe me. 1) Rebecca Black (“Friday”): Poor Rebecca. She probably hoped that one day a song of hers would go viral. Just probably not for these reasons. Her voice is just so bizarre it makes listening painful. Then, she gets autotuned out the wazoo. She pronounces Friday like she’s just learning English. Then, there’s the music video. Rolling Stone says it might be a good thing. 2) Jenna Rose (“My Jeans”): This song makes me want to listen to Black’s on repeat (!). Oh my god. Talk about Autotuning something to death. She sings about jeans, Miley Cyrus and hanging out with her friends (OMG!). Wow, it’s horrible. And then someone decides that a rap would be a good idea. Wrong. Just so wrong.